WHICH FILM WOULD WORK MORE: COMEDY OR HORROR COMEDY? YAMLA PAGLA DEEWANA 3: It is the third part of this fun franchise and stars all the three Deols – father Dharmendra and sons Sunny and Bobby Deol. The first part released in 2011 and was directed by Samir Karnik. It did great business at the box office (Rs. 54.93 crore) and was loved for its performances, writing and funny moments. Encouraged by the response, the makers decided to make part 2 and this time Sangeeth Sivan was given charge as director. Yamla Pagla Deewana 2 released in 2013. The promos weren’t that funny and yet the film had a decent opening at Rs. 6.36 crore, less than the opening of part 1 (Rs. 7.64 crore). But the film was a disappointment and did a business of just Rs. 30.77 crore. Many thought that it was the end of this franchise. But surprisingly, the Deols last year launched Yamla Pagla Deewana Phir Se. Punjabi director Navaniat Singh was appointed as director this time. Besides Deols, part 3 also features Kriti Kharbanda, Johny Lever, Asrani and others. For a grand song, Rekha, Sonakshi Sinha and Salman Khan have done cameo appearances. Moreover, Shatrughan Sinha is seen in the role of a judge. Again, just like part 2, the trailers and songs of Yamla Pagla Deewana Phir Se haven’t worked. Sunny and Dharmendra have given some fine interviews but overall, the marketing for some reasons seems ‘thanda’. The buzz is limited and it seems that the opening day would be even less than the opening day numbers of part 2! If the response is bad, the lifetime would be the lower than Yamla Pagla Deewana 2. A good word of mouth can help the film put up strong numbers, especially in the North. STREE: It is a horror comedy based on what the makers say a ‘ridiculously true phenomenon’. Starring Rajkummar Rao, Shraddha Kapoor, Aparshakti Khurana, Abhishek Banerjee and Pankaj Tripathi, Stree is directorial debut of Amar Kaushik. It is produced by Dinesh Vijan and Go Goa Gone directors Raj Nidimoru and Krishna DK. The trailer is extremely funny and has met with a good response. The concept seems fresh and it’s a rare horror comedy of Bollywood. Songs have got noticed, especially Kamariya, Milegi Milegi and Aao Kabhi Haveli Pe. Sadly, the film doesn’t look that massy, possibly due to Rajkummar’s presence. The opening can be in the Rs. 3.50-4.50 crore range and might go higher, if evening shows record good occupancy. 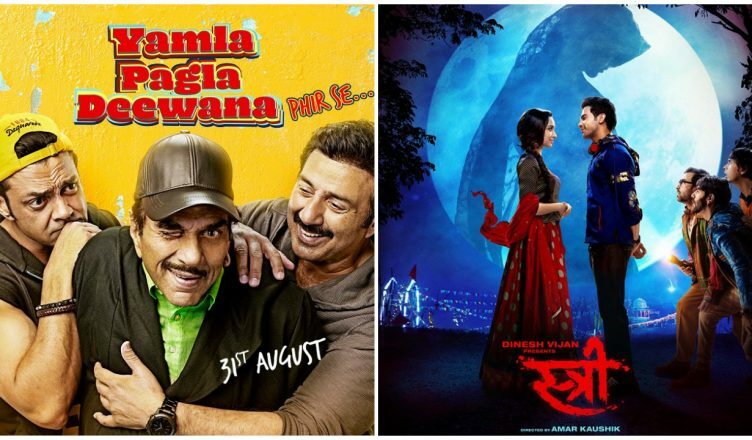 It won’t be surprising if Stree collects more than Yamla Pagla Deewana Phir Se.